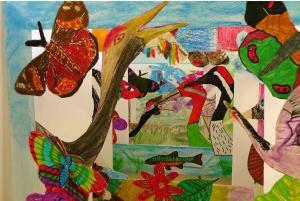 A fun day yesterday at North Newton Primary School, making crane masks with artist Melanie Tomlinson. The masks are just one of the brilliant resources for schools designed by Melanie as part of her Company of Cranes work commissioned by Somerset Art Works, which are now being made available to primary schools and children on the website http://www.thecompanyofcranes.net/ thanks to funding from InspirED. The latest batch of eggs are about to start their journey from Germany to WWT Slimbridge! The project team has been collecting eggs at the Schorfheide-Chorin Biosphere Reserve for a week or so. Tomorrow ten eggs, in their specially padded incubator, will be driven to the rearing facility at WWT Slimbridge - and soon we will have crane chicks again! A very excited Amy King has just sent some amazing news from WWT Slimbridge, where she has been watching cranes from the Great Crane Project building a nest in front of one of the bird hides! Amy will post more details and photos on the website as soon as she can, and meanwhile you can follow her updates on our project Facebook page. What a fantastic day! First, I should say hello, as I only recently joined the project and this is my first message. Today has been incredibly exciting as I met our new young cranes for the first time!